Choosing the right auto insurance can be a nightmare. The J. 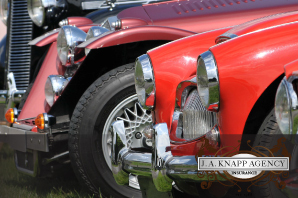 A. Knapp Agency can make it quick and easy. We gather your information, and find you the best prices and coverage by analyzing the competitors, so choosing can be the right company can be done seamlessly. The biggest discounts on good coverage can be determined by utilizing our agency to find the right auto insurance. Give us a call today at (520) 299-3720 or (740) 362-4044. It’s clear why more drivers trust us more than any other automotive insurance provider. Get your car insurance quote now, so you can keep driving. Do not force other drivers to brake or steer because of your obstructive maneuver into their path. Assume other drivers will not see you and avoid you when you maneuver into their path. Move into your intended path or direction only after you are assured you will not conflict with other traffic. Check for proper mirror adjustment. Check for broken mirrors and loose mountings. Check for proper taillight, brake light, and turn signal function. Check for proper function of horn and back-up warning signal (if so equipped). Before start-up or back up, walk around vehicle and look underneath to ensure you have safe clearance for start-up. Don’t forget to check blind area on right and in front as well. After your walk-around check, don’t delay in moving vehicle. Do not allow time for another hazard to approach. Check mirrors for proper adjustment frequently. Start up slowly at first to allow other vehicles and pedestrians, who may have unexpectedly approached, to safely move away. Tap horn in congested areas or recruit a signalman. Ensure that cargo loads are secured to prevent moving from side to side. Remember that top-heavy cargo will cause commercial vehicles to roll over in curves at speeds lower than those loaded with flat compact cargo. Reduce speed before entering curve. If you enter curves too fast, you may not have enough time to slow down before rolling over. Maintaining speeds at curve advisory may not be slow enough to prevent rollover of commercial vehicles. Since trailers usually begin to roll first, you may not know you are rolling over until it is too late. Slow down before you get into the curve. Stay off the shoulder in curves. Your right or left side wheels may drop or sink down into a shoulder and increase your chance of rollover. Slow down substantially for unfamiliar curves. Before you pass, check to be certain no one is passing you. Assume the driver in front of you doesn’t know you are passing. That driver may pull to the left to pass a vehicle in front or make a left turn. While you are passing, watch carefully for vehicles that may be entering the roadway from side roads or driveways. Assume vehicles approaching from the opposite direction will not see you or slow down for you to complete your passing maneuver. Watch out for vehicles passing other vehicles from the opposite direction. If the vehicle you are trying to pass speeds up, let it go. Don’t get into a dangerous race. Don’t take risks. If in doubt, don’t pass. Signal your intentions to pass. Broken mirrors and loose mountings. Tail light, brake light and turn signal function. Read More @ The Department of Transportation.